Students in K4-5th grade, as well as Discovery Program students, have elementary art class once a week. The art program is based on the philosophy that all children are given the gift of creativity, in the image of their Creator God. Just as our Heavenly Father loves to create, so do we! Each grade level focuses on the Elements of Art: line, shape, color, value, texture, space and form. Students also learn about some of the Principles of Design: pattern, contrast, emphasis, balance, harmony, rhythm, movement, unity and variety. Projects change from year to year depending on the class interest and teacher inspiration, but the concepts are taught with varying complexity from K4-5th grade. 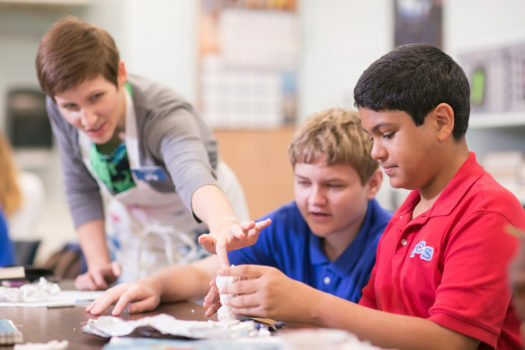 Students participate in various art shows and competitions in the area including the annual Kids Platform Art Show, Bartow Bloomin’ Arts Festival and the Kids Tag Art for fifth graders in Polk County. 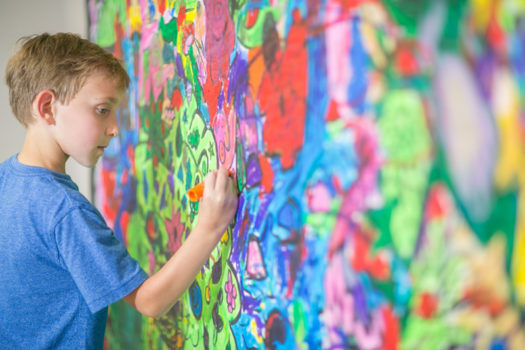 During the spring, the students look forward to a big art show on campus in which each child has a piece of art framed and on display. They are always excited to choose their favorite piece from the year and show it off to their family and friends. Local artists come to help judge the show, and they choose a first, second and third place winner for each grade level. Families enjoy this evening at school with various art stations set up around the campus for parents and children to create and make together. High School art classes are offered at all levels from beginning to college including AP 2-D Design and AP Drawing. In order to earn college credit students complete and submit an online digital portfolio for their exam in May. This is a college level course designed for students who are seriously interested in the practical experience of art and wish to pursue artistic development and mastery in concept, composition and the execution of their ideas in the area of 2-D design or Drawing. AP Studio Art is not based on written exams; instead, students submit portfolios for evaluation at the end of the school year. Art students at Lakeland Christian School benefit from a number of local competitions and opportunities to show off their artistic talents to the school family and local community. Students’ creations are frequently displayed throughout the school. Students participate in the annual Association of Christian Schools International (ACSI) Art Festival. Our students frequently score Superior ratings and have received numerous ‘Best of Show’ awards. High school art students have participated in a number of special community-wide events and competitions , such as the Polk Museum of Art’s Annual Congressional Show, Chalk for Charity benefiting the KofC Global Wheelchair Mission and LCPAAA Charities and volunteering their artistic talents at numerous animal shelters, churches and local businesses. In the spring of 2012, LCS art students had their 2nd annual Arts on the Park Gallery Opening in downtown Lakeland. Students will matted and displayed their own work, showcasing their talents. Artwork is made available for purchase.